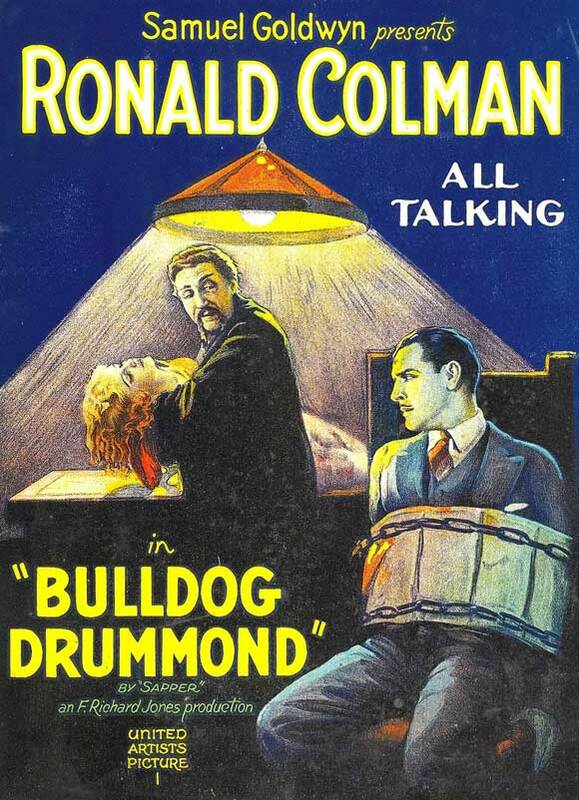 The 1929 version of Bulldog Drummond stars the dashing Ronald Colman. If you are not familiar with Bulldog Drummond, you should correct that fault. Hugh “Bulldog” Drummond is one of the singular British heroes of the period between the World Wars. He is the creation of “Sapper” (otherwise known as H. C. McNeile. Sapper did ten novels featuring Drummond prior to his death in 1937 from throat cancer. The series of was continued by Gerald Fairley (seven novels until 1954) then Henry Reymond (two novels in the late ’60s). While not a first-tier character like Tarzan, Sherlock Holmes, or Superman, he was a fairly well-known and popular character during his time. His popularity was on a par with Fu Manchu. Wikipedia lists 23 films featuring Drummond from 1922 to 1969, including the two silent versions with 12 different actors taking on the role. Alan Moore even inserted him into the League of Extraordinary Gentlemen history, while Philip Jose Farmer includes him in his Wold-Newton Universe of various heroes and villains. The 1929 version of Bulldog Drummond has several distinctions going for it. First, it was a talking picture. Second, the star was a well-known silent film star trying to make the jump to the talkies. Ronald Colman was dashing and heroic. He had appeared in more than 25 films prior to the talking revolution, per IMDB. Samuel Goldwyn wanted to make a splash with Colman’s debut in the sound era, and he decided Bulldog Drummond would be the vehicle. As Singing in the Rain showed us, many silent stars had trouble making the transition. Colman was not one of them. This was the perfect choice. In fact, he got an Academy Award nomination for Best Actor as a result. But, on to the film. As it opens, “Bulldog” Drummond is sitting at his club one night. He is amazingly bored. The most exciting thing happening is that someone has dropped a spoon. He is too rich to work and totally bored. So, he posts an ad in a London newspaper. He states that he is bored and looking for adventure. It gives a post box for replies. Almost immediately he receives one. A woman asks if he is serious. If he is, she requests that he meet her at an inn where she has reserved a room for “John Smith.” She asks to meet him at midnight. He arrives and meets Phyllis Benton (Joan Bennett). But his good friend Algy (Claud Allister) is suspicious of the whole matter and drags along Drummond’s valet, Danny (Wilson Benge). Phyllis tells Drummond a strange story involving her uncle; John Travers (Charles Sellon), whom she suspects has been kidnapped into a hospital and is held against his will. He is rich, so money is the obvious motive. The hospital is run by Dr. Lakington (Lawrence Grant), who is aided by Carl Peterson (Montagu Love) and the slinky Irma (Lilyan Tashman). Drummond soon determines that Phyllis is correct and he sets out to rescue Travers. Algy and Danny provide some comic relief amid all the posturing, testosterone and action. There are twists and turns in the overall process, but Drummond finally succeeds. Bulldog Drummond is fun film and it kept my interest. There was some horrendous overacting by Joan Bennett, who took a little longer to make the successful transition to sound pictures. The film music was sparse, as was true early on. So there are some long silences in the film. I’ve seen several of the later Bulldog Drummond films with Tom Conway, Walter Pigeon and John Howard, who played Drummond seven times. Ronald Coleman recreated the role in Bulldog Drummond Strikes Back. They are passable B films of the times. Of course, your mileage on the first Drummond talkie may vary, particularly during the comic bits. But I recommend this one.